Marriner's now rather warm and breathily close-up Serenade is charmingly done. This is a convincing performance beside the usual parade of sighs and pallid feyness. Indeed Marriner's Introduction and Allegro might well have made a much more magnetic companion than Britten's. Britten's version is a slender thing of Mozartian delicacy, precision and athleticism. Britten chose a way quite other than that espoused by Barbirolli in his classic EMI account or by Handley on Classics for Pleasure. You will certainly find it a palate cleanser when surfeited with the school of the heart-racing dash and voluptuous surge. This is nowhere near a first recommendation in my book. Superb work though from the gilded quartet of Emanuel Hurwitz, José Luis Garcia, Cecil Aronowitz and Bernard Richards who are faithful to the Britten ethic. Contrast this with Solti's headlong and headstrong Second Symphony. There was some fuss about this when it was first issued. After all Solti takes the work at a hussar-charge gallop. 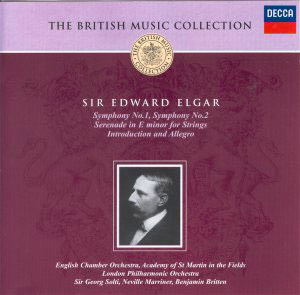 I recall interviews at the time (1975) during which he was quite open about having studied the recordings Elgar made of both this symphony and the First. I feel extremely affectionate towards this recording simply because it drew from me my first really positive reaction to Elgar. I had heard the 1970s Boult recordings (Lyrita and EMI) and the old Barbirolli version (that took up a 2 LP set!) and been left cold. Solti ripped up the old assumptions and found excitement, snap, passion and splendour. I was alerted to Solti's way by a BBC TV relay of the Symphony in 1975. Try the last three minutes of the Allegro vivace e nobilmente and the hoarse rasping bark of the horns in the Rondo. He still finds time for the Larghetto to bloom and stretch. In my experience no-one has built the crushing, slashing, silvery emotional landslide at its peak [6.13] as well as Solti. This is my top recommended version of the Symphony. In the First Symphony bravura playing, steely pliant control and pulse-acceleration takes the music further out beyond Brahms and Strauss to Tchaikovsky. Brahms' Fourth leaps to mind pretty often in the fourth movement of the First Symphony as does Tchaikovsky again (particularly the Fifth and the Pathétique). Solti is an alchemist in this music and that he achieves this with Boult's own orchestra is further testimony to his inspirational way with orchestras. Hearing his recordings again has been a joyous and visceral experience. Given the choice I would happily have sacrificed the Serenade for Solti's version of the concert overture In the South. All these recordings are aided by Kenneth Wilkinson's engineering and the lively, analytical yet sonorous qualities of the still lamented Kingsway Hall.